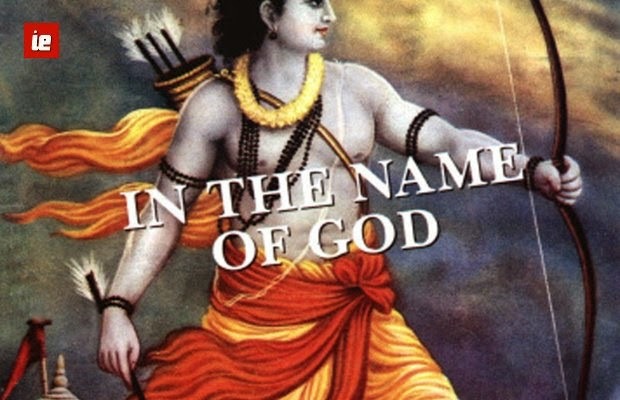 “Raam Ke Naam” (In the Name of God) is the name of a documentary film that was made in 1991, a year before the destruction of the Babri Masjid. The film was banned in India, pending court cases that ended in 1997, even as it accumulated accolades in international film festivals. The film follows the journey of L. K. Advani’s rath yatra that culminated in the destruction of the 16th century mosque. It interviews several people along the way, ranging from the fanatic members of the procession to Ayodhya priests, local junta and even Govt officials. Today, as we head into the final phase of probably the most historic election in our country, as the forces of truth and non-violence attempt to battle democratically against the powers of Hindu extremism, centered on the holy ground of Varanasi (a.k.a. Kashi), let us pause to contemplate the lessons that are ringing out to us through the voices in “Raam Ke Naam”. Because “those who cannot remember the past are condemned to repeat it”. The Babri Masjid, built in 1527 by the first Mughal emperor Babur, is one of the largest and oldest mosques in India. Excavations by the Archeological Survey of India suggest that the previous structure at the location of the mosque was a Hindu temple, that was presumably torn down by Babur to build the mosque. More recent excavations in 2003 show the remains of a structure that predates both the temple and the mosque, that clearly was also torn down for the purpose of building a Hindu temple… ah, nothing to worry about, they are simply Buddhist ruins and Buddhism in India, as we all know, is a peace-loving religion, quite different, in fact, from the fearsome things we have all been told about Islam! As it turns out, Ayodhya, claimed to be one of the oldest cities of Hindu heritage also has deeply historical significance for Islam, Buddhism and Jainism. As of the 2001 census, 59% of the population of Ayodhya was Hindu, 40% Muslim with Buddhists and Jains forming the remainder. For 422 years since the construction of the Babri Masjid, Hindus and Muslims had been peacefully praying to their respective Gods in close proximity to one another. Then on 22nd December 1949, as the BJP and VHP fable goes, Lord Rama appeared in the dreams of the priest Mahant Ramsevak Das Shastri in the form of a child and inspired him to set up a Praakat Utsav aarti in the middle of the Babri Masjid. By his own admission, his earthly sponsor in this effort was the District Magistrate Mr. K. K. Nayyar, who carefully orchestrated the sneaking in of the Ramlalla idols into the Masjid. Mr. Nayyar was openly supportive of the VHP and later went on to become a member of Parliament, elected from a constituency close to Ayodhya. Despite this intrusion into their place of worship and the denial of justice to them through democratic means, the Muslims of Ayodhya continued to coexist peacefully with the Hindus in their communities. “Hazaron saal baad”, on 25th September 1990, L. K. Advani started his Ratha Yatra from Somnath, Gujarat, to Ayodhya. At the front of the procession sat Narendra Modi, in his role as charioteer. In his speeches, L. K. Advani promised several times that there would be no violence as a result of his yatra, but the trail of dead bodies he left behind spoke louder than his words. He aimed to reach Ayodhya by 30th October, the date of the annual Panchkosi Parikrama, deliberately with the intention of disrupting pilgrims with added Govt. security in the Ayodhya temples. The yatra was stopped at the border of Uttar Pradesh by Chief Minister Mulayam Singh Yadav. The BJP went from two Lok Sabha seats in 1984 to 85 seats in 1989 and 120 seats in 1991 as a direct result of Advani’s Ratha Yatra. Where did the VHP get the funding for these massive efforts? The film interviews a Deputy Commissioner in the Income Tax Dept, who issued a summons to Ashok Singhal and the VHP to investigate their funding. Within a day, he was transferred to Madras, the enquiry was suppressed and soon after, he was suspended. The Reserve Bank of India (RBI) does not allow political parties and organizations that preach violence to repatriate funds raised outside the country. Breaking the law, the VHP set up an affiliate with 200 branches in the US and Canada and more than 1 lakh members, through which it raised nearly Rs. 20 crore to spend on “building temples”. When faced with the prospect of jail-time for their fraud, the VHP threatened to withdraw its support from the then Govt. And they threatened to kill this income tax officer. All this in the name of our Hindu religion! When the BJP came to power in Uttar Pradesh in 1992, Pujari Laldas was removed from his post as head priest of the Raam Janmabhoomi temple. He was assassinated a year later. He had knowingly risked his life by consenting to his interview in the documentary, but he did it because he wanted his message to reach the people. Religious violence that spread like wildfire across the subcontinent after the destruction of the Babri Masjid resulted in more than 5000 deaths, just as the Pujari had predicted. To his dying day, the Pujari never lost faith in our ability to come back to our senses and follow the path of truth and non-violence. One thing I do agree with – “Jis Hindu ka khoon nahin khaule, khoon nahin woh paani hai!” My blood does boil. It boils when I watch the anger with which one of the Kar Sevaks shouts that Nathuram Godse was justified in killing Mahatma Gandhi because (in his words) “jo is desh ke saath gaddaari karega, uska yahi anjaam hoga”. How many more deaths will it take before we as a nation see through the hatred that these narrow minded bigots plant just for their political gains? How many more years will we continue to be willing slaves to Hindu fanatic leaders who spread death and misery in the name of development? It is time for us to break away from them and cast them aside like the parasitic leeches that they are. With my boiling blood, I therefore pledge that this year and for the rest of my life, I will avenge Gandhiji’s murder by supporting truth and non-violence. Because I do have a choice. Because I do not have to repeat my mistakes. Hey Raam!